Milk porridge / Rice and coconut milk porridge / Paal kanji / Thengaa paal kanji / Rice soup with coconut milk is an easy, delicious traditional dish which tastes heavenly mainly for dinner. It is an easy comfort food with all the goodness of coconut milk. This porridge comes with lots of health benefits and is very good for kids and vegan lactation mother. The use of coconut milk in this porridge cools down body heat. It is very good to have this porridge often for dinner or at least once in a week which helps in easy digestion. 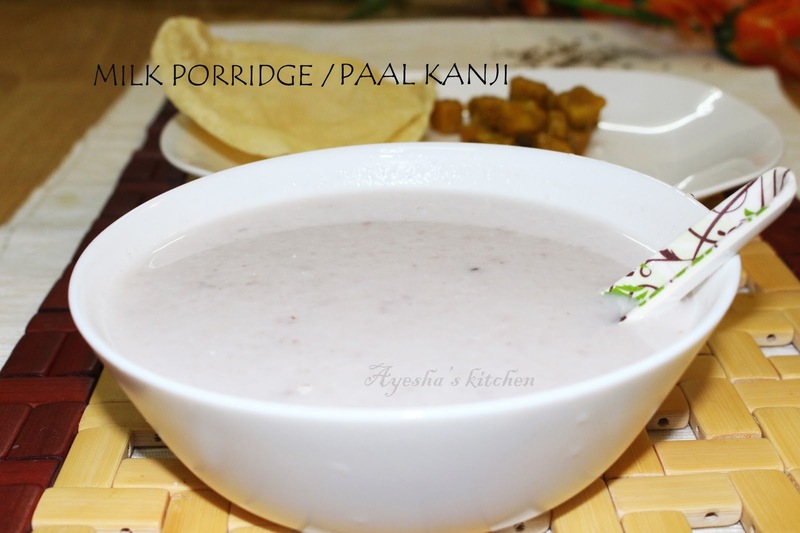 Do try this healthy simple paal kanji recipe at home. Wash and clean the broken rice and set aside. Add this broken rice to a pressure cooker along with 2 cups of third extracted coconut milk. ( Take 1 whole coconut grated and add half a cup of warm water. Blend it in a mixer for 1 minute. Then extract its milk and that is called as FIRST EXTRACTED COCONUT MILK. It is poured in the final stage only......Then again add 2 cups of water to that coconut, grind in a mixer and then extracted coconut milk is the SECOND EXTRACTED COCONUT MILK. Finally, repeat for the last time and then extracted is the THIRD EXTRACTED COCONUT MILK). Pressure cook it for 2 whistles. Open the lid of the cooker when the pressure settles down. Rice will be cooked well without any water left. Stir the rice well and add 2 cups of second extracted milk and switch on the fire. Mix well with the rice. Let it boil. When boiled, add 1 cup of first extracted milk along with some salt. Milk well and switch off the flame. Do not allow it to boil after adding the thick first extracted coconut milk. 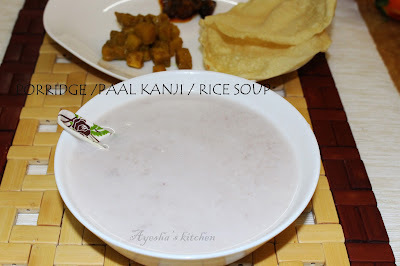 Healthy Rice soup with coconut milk / paal kanji / Rice and milk porridge ready.